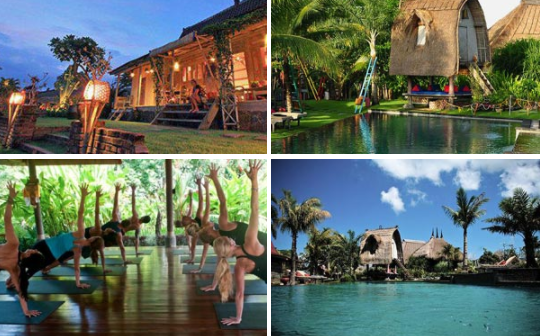 Bali – The Ultimate Yoga Holiday with Ihana Yoga. Join Ihana Yoga for their annual Bali Retreat. Spend six nights at the amazing Desa Seni Eco Village Resort with teachers Jenni Morrison-Jack and Sidsel Henriksen. Described as gorgeous, serene, relaxing, therapeutic?, the five-star Desa Seni provides an authentic Indonesian experience through the exploration of culture, religion, food and complete wellness. Staying at Desa Seni is a unique experience in itself, organic food and environmentally sustainable surroundings. Nestled amongst the picturesque ricefields in Canggu, Desa Seni is only a short stroll to the famous Echo Surf Beach in Canggu, so you can combine the daily yoga with playing in the waves. It’s also only 10 minutes from the bustling hub of Seminyak and 20 minutes from the international Denpasar Airport. The retreat is designed for all levels of yoga enthusiasts. A typical day will start with a Vinyasa Flow Yoga session before breakfast. The morning practice will be the main practice of the day or the more dynamic practice to kick-start your day. The afternoon/evening sessions will include yogic explorations of different therapeutic practices including restorative and theme based asana, as well as pranayama and meditation. Most days we will also run workshops, lectures or technique sessions. With two teachers on the retreat you?re guaranteed to have all the guidance you need and receive adjustments throughout the sessions making your experience even more luxurious.